We haven't featured my beloved Dad 'Tom' in our blog for a while. 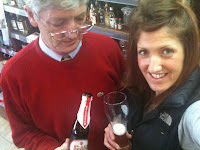 It's been a quiet Thursday afternoon so we tasted Fruili, Belgian Strawberry beer. I remember tasting this on draught in The PorterHouse a couple of years ago. I can't remember if I liked it or not and being honest I still can't decide. Pleasant? definitely. Offensive? definitely. Contains MSG? quite possibly, It wouldn't be my favourite of the fruit beer family but it's a beer that I could continue to taste until the bottle is empty. It pours the colour of a strawberry smoothie with a thin off-pink head. The nose reminds me of a 'strawberry fool' - an effortless, incredibly delicious artery clogging desert which contains fresh strawberries, sugar and cream, whipped until mousse-like. When the fruit nose settles, the white beer element of the beer is evident also. The palate is delicately carbonated, fresh strawberry with a nice lemon twist. Unless I was writing this blog I'd have forgotten it was a beer though. The alcohol is completely masked by the very strong strawberry flavour. It's a visiting beer - 4.1%, take 2 to a party when the cars outside. Available currently in Deveney's of Dundrum.